Evergreen Service Providers’ mission is to place Individuals with Intellectual and Developmental Disabilities (IDD) in stable environments where they are treated with dignity and where lasting growth in mind, body, and spirit is fostered. This can be accomplished only with the help of our Host Home Providers (HHPs) – caring and compassionate human beings who open their hearts and homes to IDD Individuals. Charlene and David Slater are two of those incredible human beings and we’re proud to recognize them as our Host Home Providers of the Quarter. Charlene is a Certified Nursing Assistant (CNA) of many years and as such, has worked with a variety of Individuals including those living with IDD. Witnessing some of the misunderstanding and mistreatment they faced, her heart went out to them. Some fourteen years ago she learned about Host Home Providers through a woman at her church who had opened her home to two IDD Individuals. Charlene began helping her with these two men and, before long, went through the training process and became a Host Home Provider herself. Apart from taking some time for her own family upon the birth of her grandson, she has worked as an HHP ever since. Earlier this year she started providing only respite care in order to help her cousin care for an aunt who was battling cancer. But when an emergency call came in from Evergreen Service Providers looking for housing for an Individual, Charlene and her husband David stepped up and welcomed Chuck into their home. Charlene said she feels like Chuck is an older brother. He is protective of Charlene, senses if she doesn’t feel well, and comforts her with pats on the back, a drink of water, and pictures he colors for her. Charlene notes that even though he may not communicate the way most people do, his capability for compassion and his ability to convey those feelings is very real. The Slaters’ inspiration to become Host Home Providers started a ripple effect that is far-reaching. Her husband, David, who is a police officer, went through Critical Incident Training (CIT) which gave him the tools and insight to work with hostage situations, domestic violence incidents and with mentally disabled Individuals. David has become a trusted friend to Chuck, including him in work around the house and yard, watching sports together on TV, attending a Rockies game, and in social activities with other police officers. Charlene shared that Chuck refers to David as “Sergeant” – even though that is not David’s rank – and feels that he is one of his “Brothers in Blue.” She is delighted to see the inclusivity that is extended to Chuck by this close-knit community. Likewise, Charlene and David’s seven year-old grandson is an ambassador for IDD Individuals. These Individuals have been a part of his family all his life and his child-size body houses a huge heart where they are concerned. It is upsetting to him when he sees classmates treat a mentally-challenged student with disrespect and he’s quick to speak up, educate and advocate for those young Individuals. His innocence, compassion and courage serve to change perspective among his peers, which translates to greater dignity and respect for countless IDD Individuals who’ll be encountered by them as they go through their lives. He is a part of – and expanding – the ripple effect initiated by his caring grandparents. Charlene is quick to point out that each IDD Individual is just that – an Individual – unlike anyone else in terms of both their challenges and the gifts they bring to the world. She would like to see more public education about IDD Individuals and perceptions about them changing faster. In the meantime, she does her part to keep the ripple effect going. 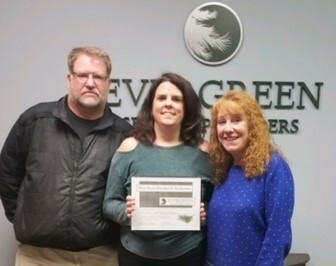 Congratulations, Charlene and David, for being selected as our Host Home Providers of the Quarter and thank you for all you do to help IDD Individuals as part of the Evergreen team.